Multiple uses. Works well. Made nice even lemon slices too! Helps evenly slice almost anything! I found that this works great on onions but also on potatoes when slicing them to fry. 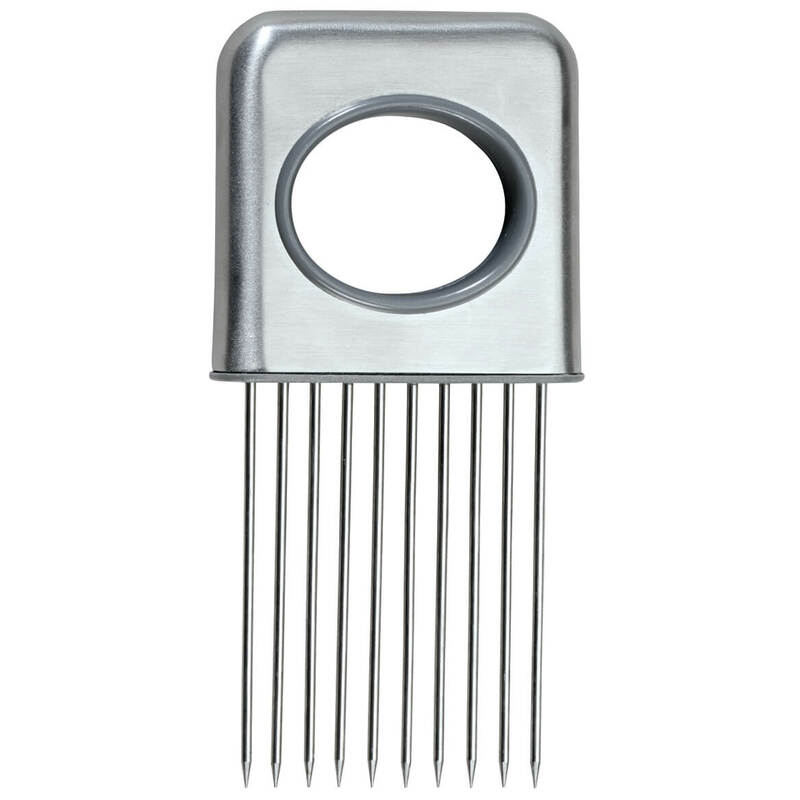 So much easier than trying to get them uniform without this tool. Great Tool. I read all the other reviews and they are right on the money. I just wanted to add that this gadget is perfect for slicing tomatoes. It provides slices that are the perfect thickness for sandwiches. I used a fairly good sized tomato, placed the gripper in the center and made beautiful slices with no problem. There were fairly thick slices leftover on either end, however I took these "heels" placed them together like bookends, reinserted the gripper and sliced them. There was virtually no waste. I am sure you can do the same with cheese so you will be able to make a quick appetizer. I also tried inserting this tool into a chicken and it had a better grip than the craving fork you would use. I see endless possibilities for this tool. The easy grip onion because you have hold the onion anyore and you hurt yourself too!! Slices meat uniformly and onions, of course. I love any gadget that makes things easier and saer for me when I'm cooking! I have always had problems cutting onions and tomatoes. This easy grip slicer works wonders. Now I can have the right size slices without the item moving. I use it for uniform meat slices. I have never been able to make nice slices of onions. This slicer has been a great help to me. It is very sturdy. Made of metal. I push it into the onion, then slide my knife along the legs/pegs. Perfect slices. I am very pleased with this slicer. Someone gave me a tip a few years ago. I wear swim goggles that I purchased at the dollar store while slice onions. I have no burning eyes. This is one of the best investments I've made, so I ordered another one!! I'm glad I bought this item. Sturdy construction. Safer than holding onions by Hand. I had been looking for this for a long time! I checked BB&B and any store I went into. Needing to replace a wooden handled slicer, I was so surprised to find it at Walter Drake, in stainless and reasonably priced. I bought two and love the one I'm using. Thanks! Fantastic device, like this one very much! this is perfect & it is sturdy & that perfect kitchen tool. this device allows me to not have to set up and then have to clean my larger equipment when i'm only cutting a single onion at a time great idea!! needs to be offered twice as wide and high to accommodate normal size onions (larger) I'd pay twice as much for a larger one!! I have used the tool to cut onions, watermellon, golden honey dew melon and pineapple. Use your imagination with it. It is a winner. Probably the best new tool I have ever bought. It makes kitchen work easier. I love the onion slicer. Quick and easy to use. It works great!!!! Great for. Slicing one way, but clumsy if slicing in multiple directions. I am in a wheelchair, these item make it easy for me to cook and clean for myself. I live alone. Have looked all over locally and couldn't find it. I ordered one for myself and like it so well I’d like to give my mom one. I like the stainless steel handle. Think it will last better than plastic. To help me slice onions. Hope this will save me from frayed fingertips every time I cut and chop!! AAugh!! Better way to evenly slice. Handy for me and to stop my daughter-in-law's tears. I need an easier way to chop onion. Safety reasons I have a tendency to cut my fingers sometimes. To help keep the smell of the onions off my hands also to help me grip the onion better. I want a more efficient way of slicing onions. I have one and love it and plan to give these away to friends/family. I eat sliced onions on my burgers and use them with my fried liver. Need thinner and more uniform slices of tomatoes, onions, eggs, etc. You cannot find them anywhere else. I got one for each granddaughter. Hope it works and gives me even sized onion slices. 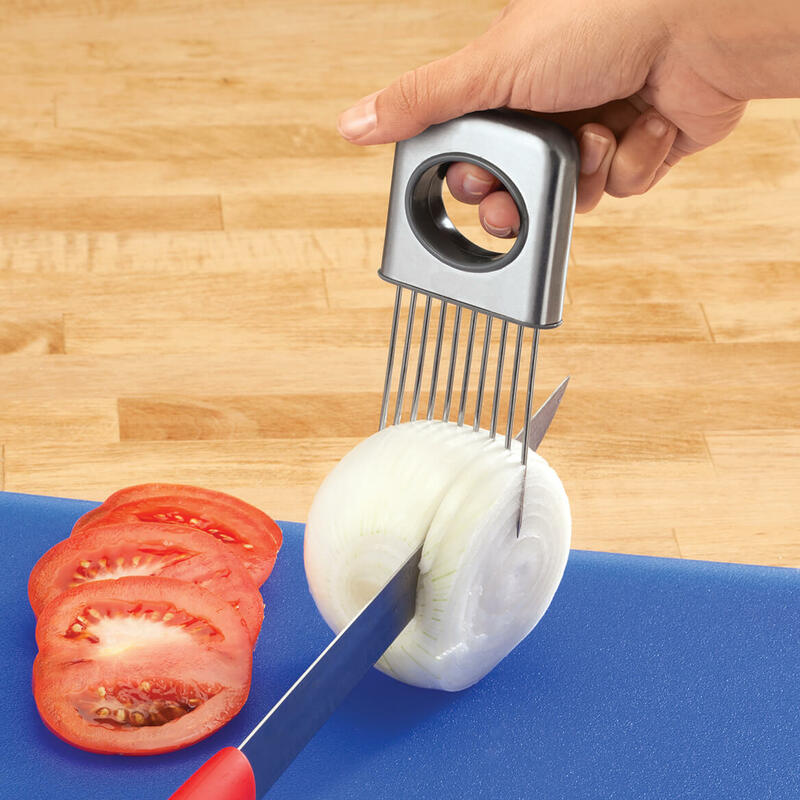 I use a lot of onions in cooking and this will definitely makeslicing easier! I have been looking for this item for some while. Welove sliced onions in sandwiches but want really thin, even slices which are very difficult and dangerous to do with just a knife. Can't to show my husband! Great item to use to keep the onion smell off your hands! Saw a video with this being used and it looked like exactly what I needed. I need it when I cut onions. I usually end up cutting a finger or two. Store locations for onion slicerdoes bed bath and beyound carry this? BEST ANSWER: Thank you for your question. We are a catalog and website based company only we do not sell our items in stores. We hope this information will be of help to you. Yes they do. They have most everything sold else where. The description of the onion slicer says it is stainless steel. Is the handle stainless steel as well as the prongs? BEST ANSWER: I believe it is. The handle is silver but a little bit more than a matte finish then glossy like the prongs. I love it. Slicing onions and tomatoes is a breeze using it. I`m sure you will love it to. Yes, The hand le is stainless Steelton as well. You won't regret this purchase! Yes, it seems to be and has brushed finish. Will this work for tomattos too? BEST ANSWER: yes it does work for tomatoes! But they can't be huge. If they are, just cut them in half. I also use on cucumbers! Just slice a chunk and your slices are all even. Just use your imagination! It might; however the tomato would need to be very firm. I would only place the slicer times only 1/2 way through the tomato. video on using this slicer. My slices were not uniform? BEST ANSWER: you decide the thickness by either slicing between each space or every other space. A little practice you will get what you are looking for.